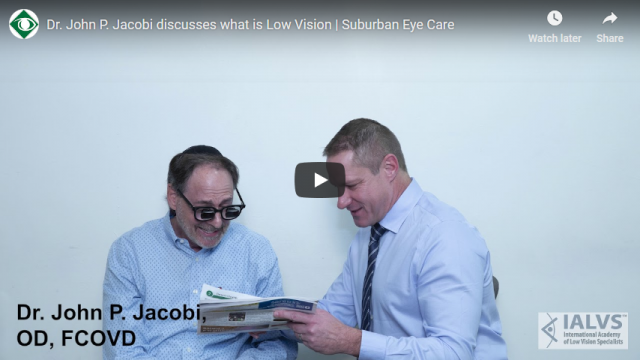 Our low vision optometrist, Dr. John Jacobi, is a member of the International Academy Of Low Vision Specialists, a professional organization dedicated to enabling low vision patients access to the optical and digital technology that will transform their life. Dr. John Jacobi is passionate about low vision care and making a difference in our communities. While commonly associated with seniors over the age of 60, Low Vision also affects children and adults of all ages. Age-Related Macular Degeneration is the most common cause for Low Vision in the US, however patients from all over Michigan visit for Low Vision care for a wide variety of conditions and diseases. During your low vision eye exam, Dr. John Jacobi will determine your level of vision, see if new regular glasses will be an improvement, discuss your wish list and help decide the best solution to help you regain as much day to day functioning as possible. A Low Vision Eye Exam should be conducted as soon as you have received a diagnosis of an eye disease or condition that could lead to Low Vision. A Low Vision optometrist stays up to date on the latest research in slowing down the progression of vision loss, so it is essential to book a Low Vision exam right away. 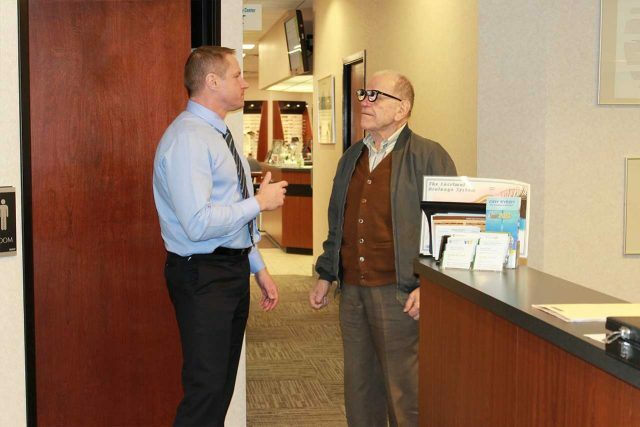 Most of our patients visit us after years of struggling with severe vision loss. If you or a loved one have a visual impairment, call our Low Vision doctor for a free phone consultation to understand how you may be helped. If you are in doubt our Metro Detroit low vision optometrist can help, we encourage you to call and Dr. John Jacobi will be happy to discuss your concerns on the phone. For example, A 65-year-old patient with Macular Degeneration wanted to be able to go shopping and visit people without feeling like a burden on others. Our Low Vision optometrist, Dr. John Jacobi, custom designed bioptic telescope glasses that enabled the patient to drive, read, and go shopping once again, without needing the help of others. Driving rules are complex and constantly changing. We have helped low vision patients from all over Michigan regain their independence and drive again with bioptic telescope glasses. Our Low Vision Optometrist, Dr. John Jacobi, helps patients from all over Michigan, with eye diseases such as macular degeneration, glaucoma, diabetic retinopathy, retinitis pigmentosa, cataracts, vision issues related to albinism, and more, to maximize their remaining vision to its full potential in order to recover and save vision functionality. 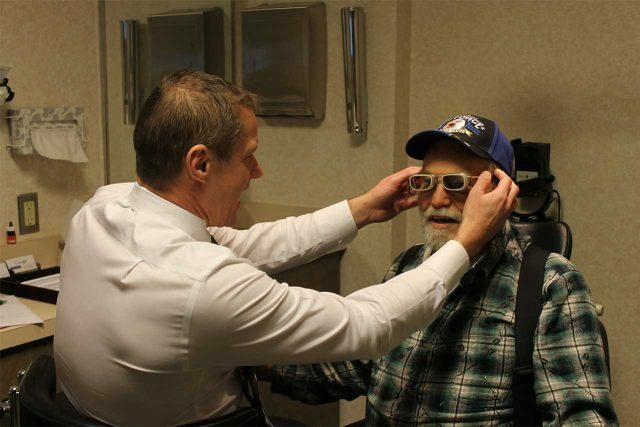 This is done with the help of highly specialized Low Vision optics/glasses and other vision aids that help patients regain their independence. Dr. John Jacobi, our Low Vision eye doctor, is passionate about helping people in Michigan recover their day to day functioning. Too many patients leave their ophthalmologist or retinologist thinking there is nothing left to be done but manage the disease to prevent further vision loss. 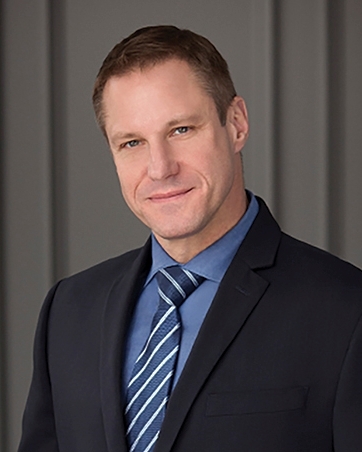 Dr. John Jacobi is a member of the International Academy Of Low Vision Specialists (IALVS), the premier organization of Low Vision Optometrists. All members of IALVS receive extensive training to learn how to help patients with vision loss maximize their remaining vision using the latest devices and technology. For many people, proper use of a Low Vision device means being able to read, drive, sew, play cards, watch television, and use the computer—all of which would be impossible without these Low Vision Aids. At the Low Vision Center At Suburban Eye Care, we help patients from Metro Detroit, Plymouth, Ann Arbor, and Dearborn to enjoy life after vision loss with Low Vision Aids. Because of the large range of options, it is crucial to speak with a Low Vision optometrist who will help you navigate the options and find the option that will give you the best solution to your specific needs. Low Vision Center At Suburban Eye Care is the preferred provider of Low Vision aids for patients from Metro Detroit, Plymouth, Ann Arbor, and Dearborn. One of the most important Low Vision tools in our arsenal is Telescope Glasses. Dr. John Jacobi fits various custom designed full diameter, bioptic and reading telescopic glasses. This is similar to using the side or rear view mirrors as needed in normal driving. Our Low Vision Doctor, Dr. John Jacobi, has enabled countless patients in Michigan to regain the ability to drive again. If your father, mother, spouse or child is visually impaired, it can cause intense tension and strain at home. Your loved one suffering from Low Vision will likely be stressed, angry, or depressed about his or her condition and loss of independence. It is important to keep in mind the incredible stress that vision loss causes. As family members, you should encourage your loved ones to explore the possibilities that low vision care opens up. 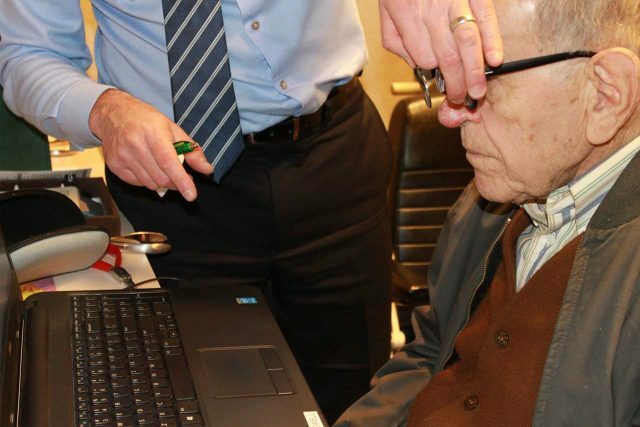 Members of the IALVS use demonstrator low vision glasses and devices during the low vision evaluation to show the patient how they can keep performing the desired tasks. If the patient does not want to speak with Dr. John Jacobi, we encourage children or spouses to talk to Dr. John Jacobi to discuss how we can help.